The International Organization for Women and Development, Inc (IOWD) is a non-profit charity based at the Kibagabaga District Hospital in Kigali, Rwanda dedicated to three primary goals: provide free treatment to women suffering from obstetric fistulas or other pelvic floor disorders, educate and train Rwandan medical staff, and promote community outreach initiatives for women's health. These goals are accomplished through volunteers with scheduled trips three times each year. As the second year urogynecology fellow at the University of New Mexico, I was invited to participate with a team of physicians and medical staff for the February mission. Our mission was January 29th to February 9, 2017 which included 136 examinations and 53 procedures. Of the procedures, 16 were rectovaginal fistulas and 19 were vesicovaginal fistulas. Preoperatively, my role included examinations to determine surgical candidates, preoperative planning, and patient counseling. 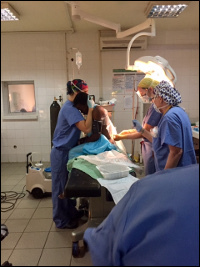 Each surgery was conducted with 1-2 attendings, a fellow, anesthesia and OR staff. My role intraoperatively was first assist and primary surgeon depending on the complexity of the case. Postoperative care was provided with twice daily rounds as a team consisting of attendings, fellows, Rwandan residents and students, and nurses. Besides direct patient care, I gave didactics for the Rwandan medical students as well as bedside and intraoperative teaching for the students and residents. At the conclusion of the mission, we accomplished the organization's goals of treatment, education, and empowerment. Personally, this experience also deepened my interest in pursuing a career in global health and education.